In the nearly 70 years since 1945, there have been a lot of World War II movies. The war was a horrible period in our history filled with atrocities and men being pushed to do the unthinkable. Many of the war films that have come out since then have highlighted this fact and David Ayer’s Fury is no different. One of its main ideas seems to be that war is hell and will have a profound effect on every man involved. While these ideas are hardly new, they work very well in the film and elevate an already tense and suspenseful tale. Fury might not be breaking any new ground, but it features some great performances, has some of the best tank battles ever captured on film and is thoroughly gripping from start to finish. The year is 1945 and World War II seems to be drawing to a close. The Allied powers continue to advance further into Germany and defeat the Axis powers. Directly on the front lines is a group of men in charge of the tank called “Fury”. At the helm is Sgt. Don Collier (Brad Pitt) and his crew consists of Boyd Swan (Shia LaBeouf), Trini Garcia (Michael Peña) and Grady Travis (Jon Bernthal). After his assistant driver is killed in battle, Collier is given the inexperienced and frightened Norman Ellison (Logan Lerman) as a replacement. The five man squad is given orders to take their tank and travel from town to town, killing any German soldiers that they may find. But just because the Germans are losing the war doesn’t mean this mission will be easy; German tanks are stronger than American tanks and the Nazi soldiers are willing to do whatever’s necessary to stop the men inside “Fury”. Fury is able to separate itself from the pack of WWII movies by focusing primarily on the members of a specific tank and the tank warfare that they experience. Each of the five members has a specific job to do and it’s pretty fascinating to watch them operate inside the slow moving vehicle. The inside of the tank is cramped, dark and dirty and never for a moment did it feel inauthentic. Ayer reportedly used real WWII tanks for some of the filming and the attention to detail shows; from the costumes and the makeup, to the beautiful locales and set design, the film feels like a completely accurate recreation of the European Theater of WWII. The sound design of the film is also spot-on. From the barrage of gunfire to the roar of planes flying overhead to the slow crawl of the tanks, the sounds in this film deserve to be listened to in the best medium possible. It’s not a WWII film without some fighting and the tank battles on display here are intense and well directed. Even during the action, Ayer spends a lot of time under the hood of the machine, showing us what each character is doing inside the tank. It’s great to see these five guys work together and watch them continue carrying out their mission in the most dangerous circumstances. A sequence that pits four American tanks against a single, superior German tank is shocking and exciting, while the film’s final standoff feels so real that it’s frightening. These men are literally putting their lives on the line and we’re able to truly feel that sense of danger when they come up against a squad of SS Nazis. There’s also a sequence in the film where the action abruptly screeches to a halt as we watch Collier and Ellison play house with two young German women. Some may argue that this long scene messes with the pacing of the film, but I found it to be extremely interesting. Not only does it help further develop these two characters, but it also shows how desperate they are to receive some semblance of normalcy within the consistent chaos that they’re exposed to day after day. Upon first glance, these five characters may seem like walking clichés: they’ve got the tough commander, the frightened rookie and even the animalistic war mongrel. I initially thought that spending over two hours with these people would seem like a chore, but I somehow ended up truly caring about all of them by the time the film reached its final act. As this ragtag team squared off against a powerful German army, I couldn’t help but be frightened for every single one of them. It’s the performances that ultimately allow us to care for these thinly written characters. As Collier, Brad Pitt continues to prove why he’s one of the most consistent and reliable actors working today. He may have a tough exterior, but Pitt exposes the heart of the character without ever forcing things. The young Logan Lerman gives one of the strongest performances of his career to date as the unprepared rookie tank assistant. Ellison is seeing the true effects of the war for the first time, thus allowing the audience to place themselves in his shoes. He’s scared and he doesn’t know how to fight, which makes him immediately relatable for most audience members. Shia LaBeouf, Michael Peña and Jon Bernthal’s roles might not be quite as expansive, but they each give performances that are worthy of praise. From the story, to the themes, to the characters, there’s nothing particularly new on display here. But writer/director David Ayer successfully treats the soldiers of WWII with respect while also commenting on the truly brutal nature of war. Aided by strong cinematography from Roman Vasyanov that makes the European countryside feel both grounded and grim and a suitably intense score from Steven Price, Ayer creates emotions without ever crossing into cheesy sentimentality. 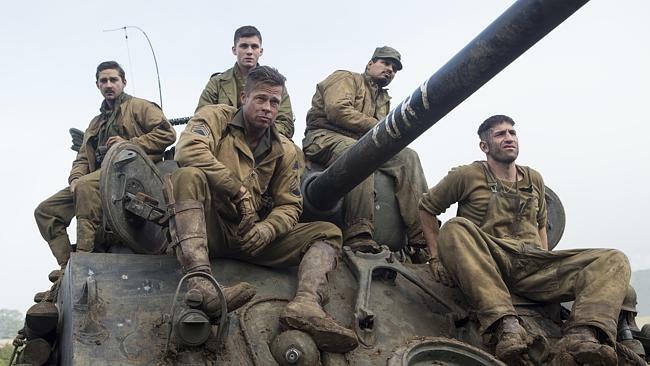 By making the war seem legitimately scary, Fury earns its place alongside all the great WWII movies.